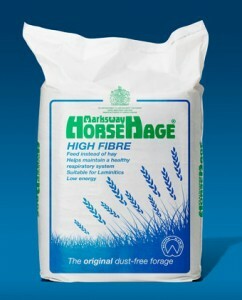 High Fibre HorseHage is made from selected ryegrasses, which have been allowed to mature for longer before harvesting to attain higher fibre, lower protein and lower energy levels. Because High Fibre HorseHage is low in energy, it is generally suitable for all Riding Club and Pony Club horses, native ponies, veterans and those that are resting, convalescing or are laminitic. The HoofKind logo denotes its suitability for laminitics. The unique fermentation process that the grass undergoes in the production of High Fibre HorseHage keeps the sugar and starch levels considerably lower than in other forages. High Fibre HorseHage also provides an excellent fibre source for competition horses being fed high levels of concentrate helping to reduce the risk of digestive upset including gastric ulcers.